I got a question recently from Jodi of My So Charmed Life. Jodi considers herself "a novice sewist," but as you can see from her blog she has solid skills and a wonderful design sense! "When I try to overcast sweater fabric, it doesn't move and I'm considering getting a walking foot [...]. Can I overcast with walking foot?? Is it designed to accommodate that?" asked Jodi in her email. 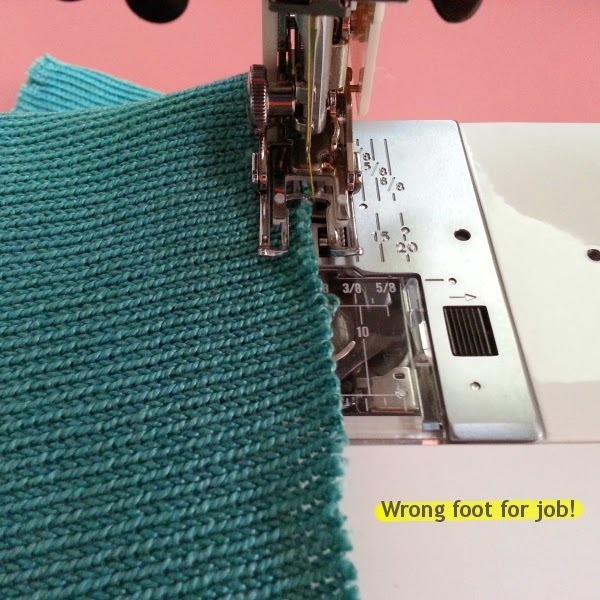 As Jodi correctly suspected, a walking foot isn't designed to accommodate overedge stitching. Those two "toes" on the foot are designed to help feed the fabric toward the needle. If you were to overcast using the walking foot, one toe would be totally off the fabric and you'd be losing 50% of the "extra upper feed mojo" (technical term ;) ) that a walking foot provides. Best to use a foot made specifically for overedge stitching. If that doesn't work, there are other things you can try. Before I had the chance to write this post, Jodi informed me that she had found a solution to get her fabric moving smoothly. She is now zigzaging further away from the cut edge and then trimming close to the stitches. I imagine it's similar to this method, but without the walking foot. Jodi, I'm so happy to hear and see (She sent pics!) that this is working for you! Here are some tips for others who may have a similar problem with sweater knits. 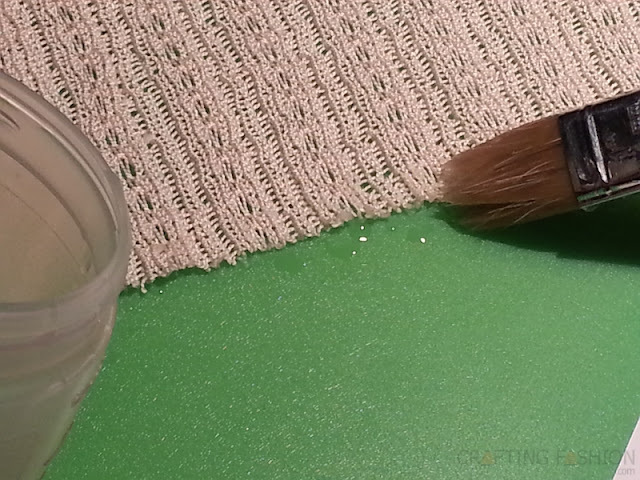 Some of these methods are scattered around the blog, but now I've compiled a list to help smooth sweater knit sewing, if your fabric stops moving the way Jodi's did. Tip #1. If you can lessen the pressure of your presser foot, do it! Some low-end and starter machines don't have this option. Many electronic machines have "intelligent sensors" to adjust the pressure for you, so this may not be a possibility. 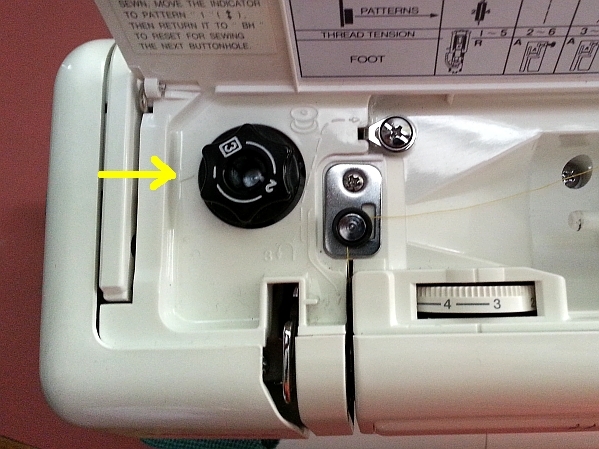 If you have a mechanical sewing machine, the knob may be on top of the machine (in line with the presser foot). Or perhaps it's on the left side. (Thanks, Brooke! See comment below.) It may or may not have fixed settings. My machine (Amazon affiliate link) is mechanical and has three fixed levels of pressure. 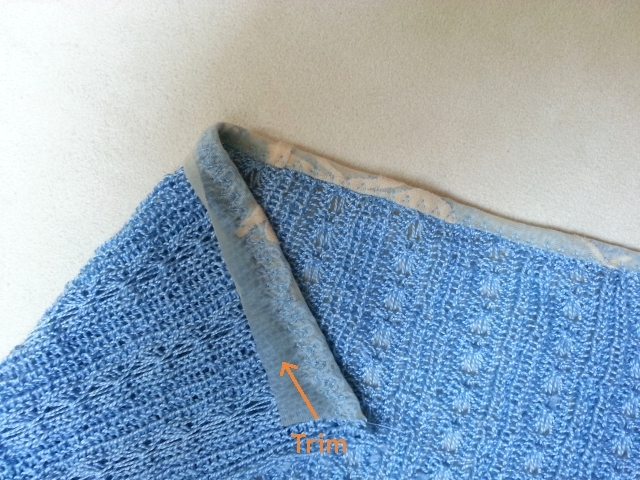 Level "1" gives the least pressure and works like a charm on sweater knits. Tip #2. Sew further away from the edge. This is what Jodi did. Even with a special overedge foot, your sweater knit may be too squishy and stretchy for the fabric to feed through easily. Sewing further in from the edge gives the feed dog and whatever foot you're using more territory (fabric) to grab onto. It also lessens the chance of the edge getting stretched out. You won't be able to use your edge foot, and you may need a wider seam allowance. After sewing, just trim close to the stitches. Tip #3. Pin a narrow strip of Sulky Super Solvy Water Soluble Stabilizer (Amazon affiliate link) underneath the fabric before sewing. The strip of Solvy will lie between the fabric and the feed dogs, and the fabric will feed through very smoothly. Some people recommend using tissue paper or tear-away stabilizer this way. It works, but you may be left tweezing away bits of paper that get stuck under the stitches when you're done. This is not just a simple adjustment on the machine. It is more work, and so is the next tip which also uses Super Solvy. Tip #4. Follow the Super Solvy Water Soluble instructions for making a solution. Paint on edges. Let dry. (More detailed info can be found here.) This will stabilize the edges of your fabric, temporarily removing all the squishy and stretchy that was giving your machine a hard time. Your fabric will feed right through your sewing machine now and the Super Solvy will come out in the wash. Tip #5. Try a stretchy Hong Kong finish. I know I'm always talking about my new favorite edge finish, but this really is my new favorite edge finish!! I love it much more than a serged edge at this point. Try placing the binding on the bottom in Step 2, instead of on top. It may be easier to feed through the machine that way. All other steps would be the same. I'm pretty sure one of these tips will help someone who wants to sew sweater knits, but who's machine is resisting. If none of these help, read on. Not really a tip: Consider another machine. I know that's not practical most of the time, but if you can't find a solution, and you were considering a new or new-to-you machine anyway, and you're planning on sewing lots of sweater knits, it might be something to consider. I own a Singer sewing machine that I bought decades ago, (currently not available to me as it's in storage and out of state). It's not the top of the line, but it sews all sweater knits beautifully, without a walking foot. My last machine, in the same price range as the first, didn't always have enough power for bulky knits and a walking foot was mandatory. No edge stitching with that machine! My current machine, a Janome, works well with sweater knits without a walking foot. (It has a 7-piece feed dog!) 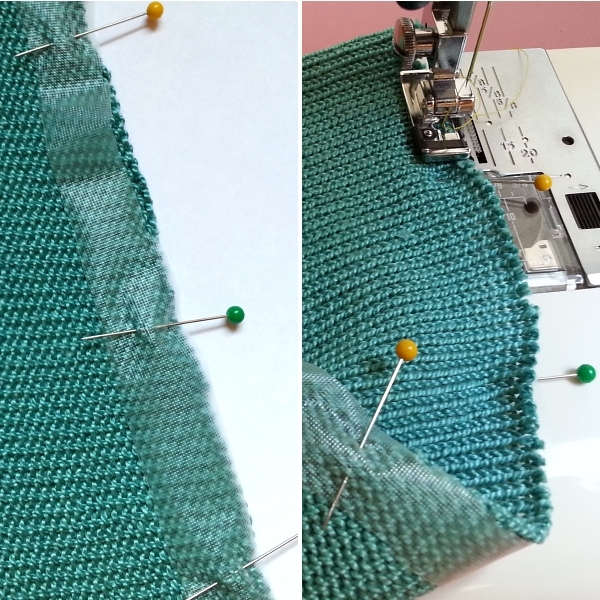 I use a walking foot if I'm sewing many layers of bulky knits, which it does with ease. I'm currently lusting after Oonaballoona's Pfaff. I imagine the IDT System to be a dream with all types of crazy, bulky, unstable knits.... Enough fantasizing. Most sewing machines can sew sweater knits! Sometimes they just need a little bit of help. The Pfaff IDT does prevent all manner of feeding problems. I have used a Pfaff for years (decades really) and I absolutely never have problems. Sweater knits, flimsy stretch jersey, canvas, multiple layers of denim, plush squishy fleece -- I have sewn it all with no feeding problems and no skipped stiches. I almost can't live without the pressure reducing dial on my machines! I have a vintage Wizard and a modern Baby Lock and both have a pressure dial (on the BL, it's on the left side instead of the top). Thanks so much for the tips! I will probably need to use one or two of these in the future! Pressure control is a beautiful thing. Good luck with the stretchy crushed velvet, Brooke! Blog updated to include alternate location of pressure dial. Thanks, Brooke. it's true, it's true, you need a pfaff in your arsenal. that IDT is the bomb. i love your sweater tips. i once pocketed like 45 pages of your blog and devoured them in an airport. best airport wait ever. :) Thanks, glad to be of service, Oona!